Christmas couldn’t come soon enough for investors – at least the market can’t fall when it’s closed. Record outflows from equity funds accompanied one of the worst Decembers on record (so far). So sharing traditional fare on Christmas Eve (fish) and Christmas Day (turkey) with family and close friends was especially enjoyable. We have much to be thankful for. Insignificantly low on that list but gratifying nonetheless is my children’s disdain for Christmas pudding (also known as plum pudding). 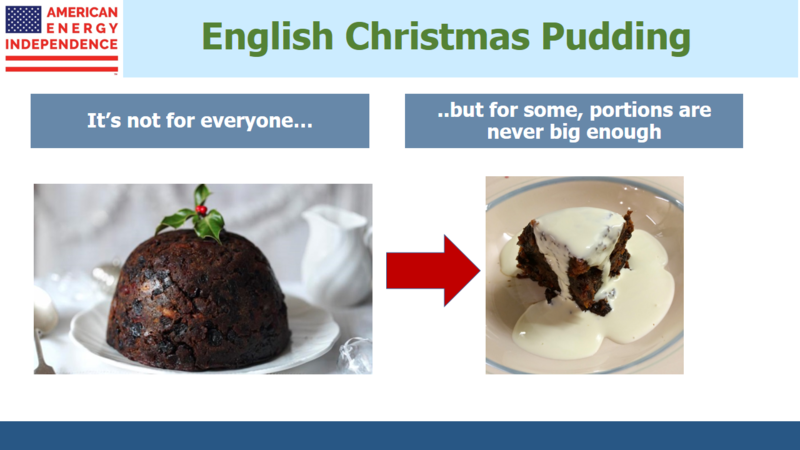 Years ago I tried to impart to them my love for this very English Christmas dessert of dark, rich fruit cake with heavy cream – but since portions are finite, I didn’t press the issue. I now face little competition for a second slice. Appetite well sated, the convivial holiday period reminds that, in spite of falling stocks, long term optimism about America and our economic outlook remains overwhelmingly the only sensible posture. 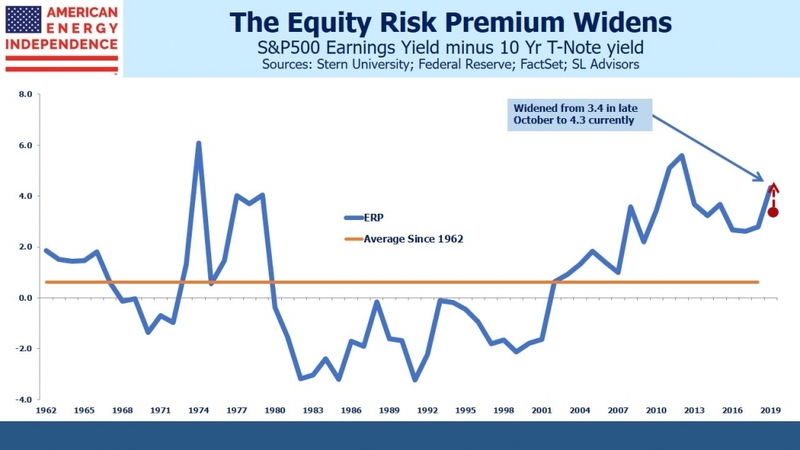 In October we noted that the Equity Risk Premium (ERP) was still historically wide, meaning that the earnings yield on stocks is sufficiently high relative to bond yields that investors should favor equities (see Bonds Still Can’t Compete with Stocks). Since then, stock prices and bond yields have both fallen. 2019 consensus earnings forecasts for the S&P500 have moderated somewhat, with growth of 8.8% versus 10.1% in October. As a result, the ERP has jumped, from 3.4 to 4.3. Stocks are now the cheapest they’ve been in six years, compared with bonds. In 2012 the ERP was 5.6, and the following year stocks rose +30%. 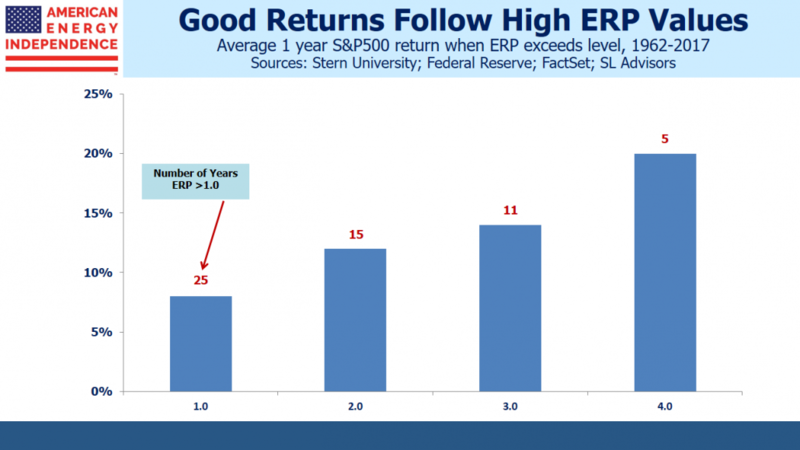 History shows that a relatively wide ERP is associated with above average subsequent equity returns, and the more extreme the ERP the better stocks do. Today, bonds offer little value compared with stocks. The inputs are bond yields, along with the level and future earnings of the S&P500. Shifts in any of these will alter the ERP. 2019 S&P earnings are currently forecast at $176 by Factset, down from $178 in October. The decline in earnings growth (from 10.1% to 8.8%) reflects developing concerns around global growth, and it’s quite possible that downward revisions lag, meaning there’s farther to fall. Treasury Secretary Steve Mnuchin interrupting his golf vacation to assure us that he’d made a few calls and can confirm banks are liquid didn’t help either. However, stocks have fallen so far so fast that earnings forecasts would have to swing to negative to bring the ERP back to where it was in October. Fed chairman Jay Powell’s press conference added to investor angst. Even though the FOMC’s central forecast of two further tightenings of policy in 2019 was down from three previously, his comments gave the impression that rates could go still higher: “Maybe we’ll be raising our estimate of the neutral rate and we’ll just go to that, or maybe we’ll keep our neutral rate here and then go one or two rate increases beyond it.” It was a clumsy communication to a market already worried about growth. The Fed has a dreadful record at forecasting the path of short term rates even though they set the Fed Funds rate (see Bond Investors Agree With the Fed…For Now). They’ve consistently overestimated the long run equilibrium rate, gradually lowering their forecast to meet that of bond investors (as reflected in ten year treasury yields). In spite of Powell’s comments suggesting several more steps higher in rates, current bond yields suggest the market doesn’t believe it’s likely. The Economist recently published The perils of trying to time the market. They noted shortcomings in relying on Cyclically-Adjusted Price-Earnings ratio (CAPE), which has wrongly been warning investors to sell stocks ever since it was first published. CAPE simply takes the average P/E over many years, to smooth out economic cycles. As my partner Henry Hoffman notes, because it doesn’t adjust for interest rates it’s of little use. CAPE says stocks are historically expensive, but overlooks that bonds are even more so. That’s what the ERP picks up, that CAPE doesn’t. The attractiveness of stocks versus bonds can be illustrated by calculating what percentage of stocks in a simple stocks/cash barbell portfolio would deliver the same ten year return as bonds. 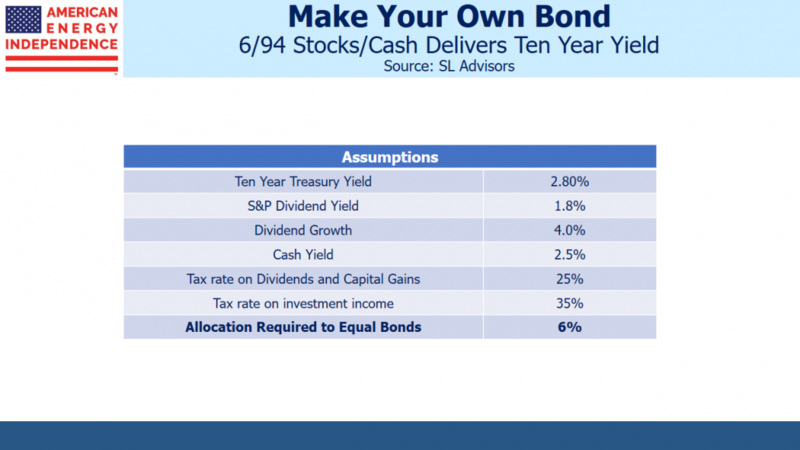 It relies on some key assumptions: that the 1.8% dividend yield on the S&P500 prevails in ten years; that we know the growth rate of dividends, the return on cash, and that tax rates don’t change. Holding all these variables constant, it shows that a very small stock investment beats ten year treasuries. That’s because the yield curve is now so flat that there’s very little benefit to extending maturities. Even the most risk averse fixed income investor can surely tolerate switching out of bonds and putting 6% of the proceeds in stocks. Cash returns of around 2.5% are looking quite reasonable, so why risk longer maturities? That only makes sense if you think the Fed’s next move will be to lower rates. We’ve also illustrated the same portfolio but using the American Energy Independence Index (AEITR), which holds North America’s biggest pipeline stocks. It yields 6.7% and we expect dividends to grow high single digits in 2019. 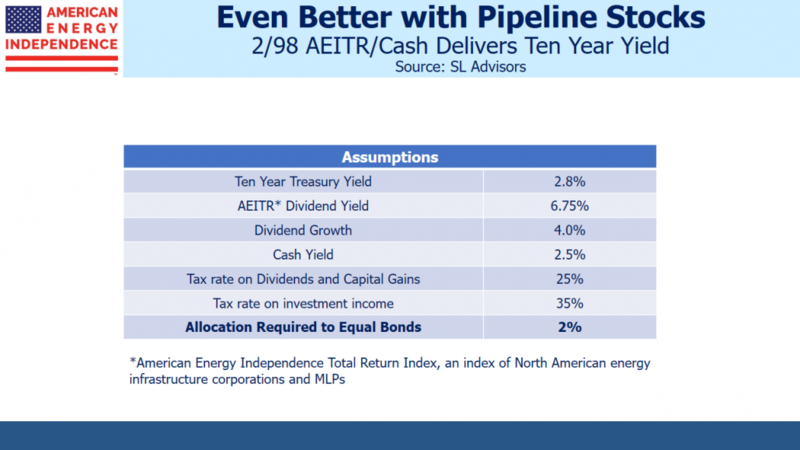 A mere 2% in AEITR, with 98% in cash, will deliver the equivalent of the ten year note’s 2.8% return, pre-tax. Stocks (especially an allocation to pipeline stocks) remain a preferable long term investment over bonds. Recent moves in both markets make the case even more compelling today.